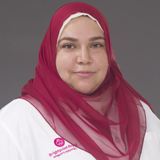 Dr. May completed her Master’s degree on Obstetrics & Gynecology from Cairo in 2012. She then started working as General Practitioner at Al Aqaser Alainy Cairo University and subsequently as family planning doctor at Ministry of Health. Later she attended ILS provider course by European Resuscitation Council in Egypt. Dr. May is fluent on Arabic and English.